Many have used Microsoft® Office Word, Excel, Outlook and recently OneNote to become more effective and efficient at performing day to day tasks. But few know that these Office products can actually talk back to you. Yes, that’s right. Each of these applications have the ability to speak text and numbers. Click the File tab (2007 click the “Office” button), now select “Options.” This will open the application options list. In 2007 click the “Customize” option. 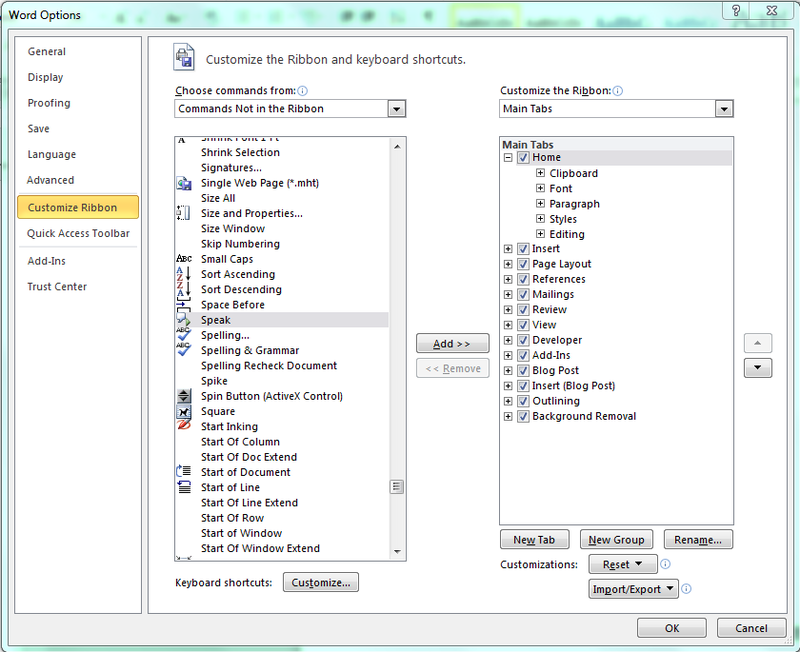 In 2010 – 2013 click the “Quick Access Toolbar” option. You will see a drop down that says “Popular Commands”, click this drop down and select “Commands Not in Ribbon”. Now in the list of commands on the left, scroll down until you get to the “Speak…” commands. Select the command on the left column and click “Add” to place the command in your Quick Access Tool bar. You can now click “OK” two times. Now you can select text / numbers, click the button in your Quick Access Tool bar and have it read the information back to you. So, now you don’t have to read that boring email. Let Outlook/Word/Excel/OneNote read it for you. And, Yes, Excel 2003 had speech. Look in the “Tools” drop down. Sandy has been a successful realtor in North Texas for over 25 years. She was consistently a top 100 producer in Texas, with Remax for many years. Sandy founded Ideal Real Estate Group as a way to not only continue to do what she does best...selling and listing homes...but as a broker to share her vast knowledge by mentoring new or struggling agents. This entry was posted in Business, Ideal Real Estate Group, Microsoft Excel, Networking, Professional Business Networking, Sandy Luedke and tagged Business, Business Excellence, Microsoft Office, speech. Bookmark the permalink. Reblogged this on Creative Communications.